Well, well, well, what an exciting surprise. 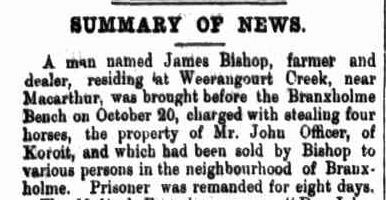 While searching the newly released digitised copies of the Mt Gambier paper, the “Border Watch“, I discovered that in 1877, ggg grandfather James Bishop was nabbed for horse theft and remanded pending trial. I suppose the find was more exciting than surprising. Why wasn’t I surprised? Well, Jim was a drover and the article revealed he was also a dealer. Many horses would have passed through his hands, probably unbranded. 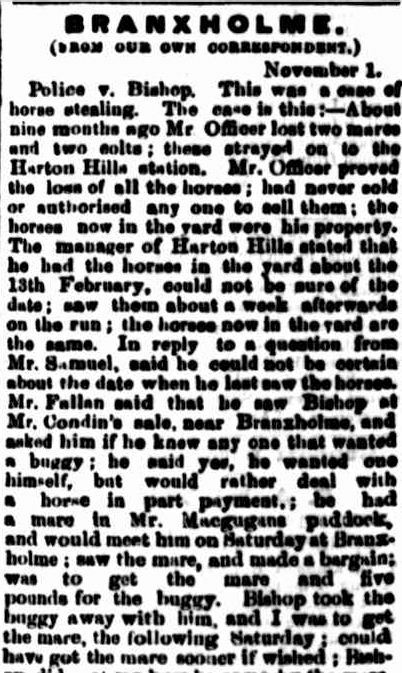 Being a drover/stockman I would doubt bookkeeping was a strong suit and after reading many Pound Notices in the newspapers of the time, a lot of horses were wandering the countryside. Mix ups could easily happen. I was, however, very excited with this new discovery. Enough to tweet about it! To find some “dirt” is always exciting. Why is it that we always get the most satisfaction from finding a record of an ancestor’s misfortune? Criminal records, wills and obituaries are favourites of mine, but don’t forget inquests and asylum records. Obviously some of the excitement is just because we have found something, anything, but it also makes the family member more interesting. These finds give them character. An extra dimension. On the point of character, I would have assumed Jim’s was nothing but respectable. A Harman/Bishop marriage (that of my gg grandparents) took place in the same year as the arrest with another in the years following. With the Harmans being self-respecting church people, I am sure neither would have occurred if there was any doubts about Jim. I had to find the outcome of the matter. I had thought of going to the Ballarat Archives Centre (PROV) where the Branxholme court registers are held (Series VPRS 4892 Court of Petty Sessions Registers). This however was not going to shed much more light on the trial itself. Surely there was more than one newspaper report. Country newspapers reported on even the smallest of stories, and the fact James was remanded made it newsworthy. Now that I had the date of the court case, I could narrow a Trove search down. Believe me, this is a great help when searching a name like Bishop where a match to the Bishop of Ballarat is more likely than any members of the my Bishop family. I narrowed down a search of “Bishop Branxholme” to 1877 and bingo, the top two matches were about James. One, I had already found, but the other from the “Portland Guardian“, reported on Jim’s trial in November 1877 after his first court appearance. While I had searched the same paper for the Bishops, I had not found this article. The value of dates! Oh and some knowledge too. If I had of found the article earlier I may have picked up it was one of my Bishops but I would have been unsure which one. Upon questioning on this matter, Jim replied he did not know how he came to have the horse. Not a good start. Evidence then moved to that of Constable Foster who arrested Jim in a plain clothes operation. Who would have thought? Jim didn’t . 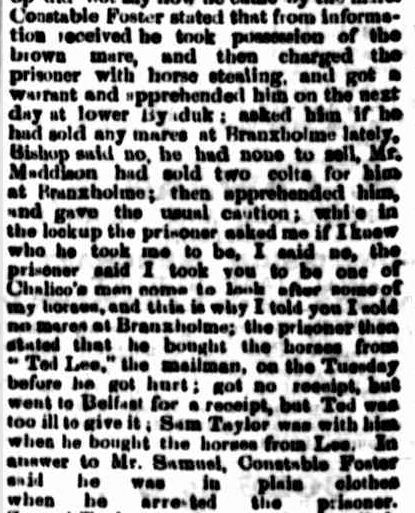 When asked by the plain clothed Constable at Lower Byaduk, prior to his arrest, if he had sold mares at Branxholme lately, Jim said “…no, he had none to sell” but added that Mr Madison had sold two colts for him at Branxholme. As two of the four missing horses were colts, Foster arrested Jim and sent him to the lockup. Then it became clear Jim was not a good bookkeeper, with him stating at the time of sale he did not get a receipt from Ted Lee the postman from whom he had bought the horse. Then Ted was hurt, so Jim went to Belfast (Port Fairy) to get a receipt from Ted, but he was too sick. Oh dear, things were not looking good. At last, a savior. Witness Samuel Taylor took the stand. He had seen Jim and Ted Lee together with four horses. 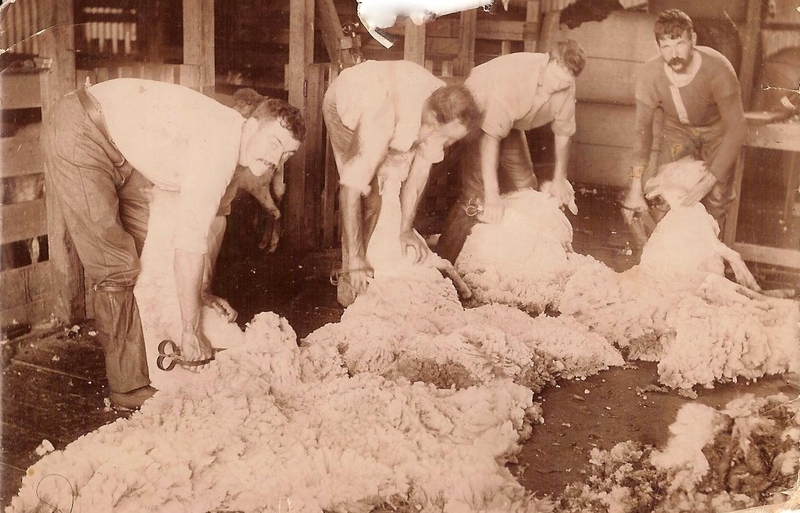 Ted told Samuel he had sold the horses to Jim. 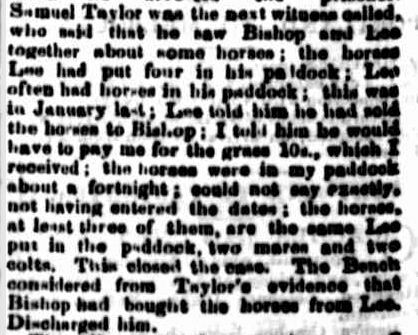 The horses were then agisted at Taylor’s property for the next fortnight. Phew. Case dismissed and Jim was off the hook. So Jim didn’t go to jail, but if it wasn’t for Samuel Taylor’s evidence, he may have. I hope he had Ted Lee lined up as a witness. Now the excitement has subsided and I can continue to consider Jim Bishop an honest man. But deep down inside, a small part of me is crying…I could have searched prisoner records! Sorry Jim! This entry was posted in Western District History and tagged Bishop, Branxholme, Harman. Bookmark the permalink. I really enjoyed reading this, Merron – and I’m just the same, if I find an ancestor with an unusual twist to their tale it gives the story a bit of something extra. Thank you for your comment Frances. They are my favourite stories to write too. Hopefully there are many more twists to come!